Check out these energy savings tips from Stream Energy for your home. Energy efficiency saves money. And deregulated energy markets, such as Texas, Georgia, Pennsylvania and Maryland, allow you to shop for the best service. Stream Energy has fixed rate plans to help with your energy savings. Consumers are constantly looking for ways to save money, especially in today’s economy. Consumers now cut coupons, limit their eating out, drive less and eliminate expenses that are not essential to their day to day living. When considering all these money savings opportunities, don’t forget to add energy savings tips to the list. One of the most confusing subjects for our customers and independent associates alike are the terms Green, Clean and Renewable. Green is a defined term that may or may not mean clean. In the State of Texas, for instance, Green is a legal term that includes solar, wind, geothermal (using underground heat to create electricity) and Biomass (burning residential waste, farm and dairy waste and manufacturing waste that is not toxic in nature). Biomass green electricity can also come from the burning of tree trimmings and brush. High-efficiency natural gas generators that pollute less than a regulated limit can also be qualified as a “green” generation source. This past weekend, it was Stream Energy’s privilege to host an Easter Egg Hunt for children served by Captain Hope’s Kids. 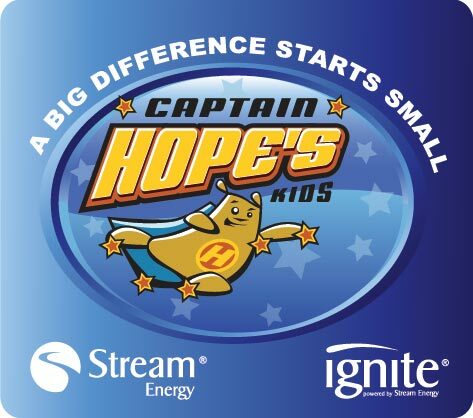 As you may know, Stream Energy has been a corporate supporter of Captain Hope’s Kids (CHK) for several years now. During the 2010 holiday season, Stream Energy Chairman Rob Snyder kicked off our “A Big Difference Starts Small” campaign with a series of commercials which highlighted the good work done by CHK in meeting the needs of homeless children in the North Texas area.